But sometimes she’s involved in something so much bigger than her or her editing skills that I am compelled to write without her approval. To fully understand this story, you have to understand my daughter. She is the girl who cares about every single living being and will always root for the underdog. She is the child who Googled how to provide emergency care for a baby squirrel and made me drive to the drug store to buy Pedialyte and a medicine dropper so she could save the one our cat dragged in. She makes me buy tofu because it never breathed, can’t enjoy shrimp because they used to swim freely in the ocean and notes that every hamburger was once a cow. And that same love of every creature is why she saved a cicada that was struggling on the sidewalk. We were walking our German Shepherd when I heard her gasp and tell me to stop. Kendall nudged “the guy” with her shoe so he could grab onto it. And grab on he did. Once he had flipped himself upright on her canvas shoe, he began to slowly make his way up toward the laces. The piercing quality of her screams gained urgency because I wasn’t acting quickly enough. By the time the cicada’s tiny, spindly legs had begun to make their way up my daughter’s bare legs, I was convinced that one of the neighbors was calling 911 to report a murder in progress. When I finally did locate a stick (because I didn’t want to actually touch the bug either), my daughter was almost in a state of panic. Thankfully, I was able to get the cicada onto the stick and then safely onto the grass. Kendall almost immediately admitted her shame at not wanting to actually touch the bug she was trying to save. I told her that was natural and she shouldn’t worry, but I couldn’t help but compare that situation to ones I witness almost every day. I work at a social service organization with a mission of improving the lives of others, particularly those living in poverty. On a regular basis, I see the generosity of others to help the less fortunate. And not a day goes by when I’m not in awe of individuals who don’t run screaming when they realize that a simple financial donation isn’t enough to raise people out of poverty. Does the money help? Absolutely! Is it the answer? Absolutely not! While there will always be individuals in situational poverty who just need that one financial boost to get them back on the right track, most of the people who walk through my office doors aren’t on any track at all. Instead, they are stumbling through an obstacle course of life designed by people who live in a world that is foreign to them. Some of them don’t understand the importance of education. 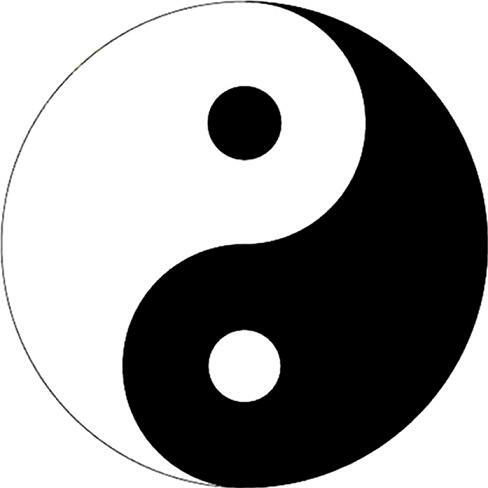 Others were taught that arguing and fighting is the only way to get what they want. And some have never even experienced the security of being a priority to parents, caregivers or anyone else who wants nothing in return but their well-being. I understand her sentiment, but that doesn’t mean we shouldn’t step outside of our comfort zones. Saving a life – whether it is that of a bug or that of another human being – often requires us to do just that. It can get messy and dirty and sometimes even scary. But if we really want to change the world, we have to touch the world we want to change. When I was in high school, my fellow students begged our teachers to grade on a curve. Their theory, of course, was that if everyone did poorly, no one would fail. That wasn’t necessarily true, but we were self-absorbed teenagers with little concern for broader implications. If you’re not familiar with the grading curve, it’s a tool used by some educators to distribute grades on a bell curve. When an assignment or test is scored, the average score becomes the average grade. The scores above and below the average are distributed accordingly. That means, if you get a really high score, you might skew the curve for everyone else. It also means some students are guaranteed to land at the wrong end of the curve. 2: I had an opportunity to prove that I didn’t need a curve to do well. And that opportunity far exceeded my concern about anyone else’s grade. At the time, my self-worth was completely wrapped up in academic success. I truly thought that the only thing at which I could excel, and which made my existence matter, was getting good grades. (Yes, I completely related to Brian in the Breakfast Club). I also believed that getting good grades was simply a matter of working hard, and that anyone could work hard. I had little tolerance for my peers who got mad when I did well. To me, they just needed to try harder. And so, I shamefully admit, I always tried to burn the curve. Needless to say, I’m embarrassed that I used to think that way. I now realize that I had so many advantages: educated parents, good nutrition, a safe place to sleep, a home free of violence, a family that embraced education, a mother who believed women didn’t need to depend on men, and a father who expected as much of his daughter as he did of his son. My list of advantages could go on and on and on. But now, all these years later, I recognize how some children start off at disadvantage simply because of the family they are born into or because of a disability. Some struggle to read. Others struggle to overcome loss of at least one parent in the house. Others were never encouraged or never had an adult who even recognized their potential. And when you are struggling just to get by, studying for test isn’t a priority. That’s why, more than 30 years later, I may be ashamed at who I once was, but I am also ashamed of some of the former classmates who still embrace the bell curve. Some of the same people who encouraged me not to exceed are now blaming their neighbors for falling at the negative end of the curve. I know this because I see their posts on social media. They complain about people “on welfare”and how they don’t want their hard-earned money going to support people who are lazy and just don’t try. The want to drug test individuals who receive SNAP (food stamps) because they aren’t deserving. And they have the misguided belief that if people just try, they can find a job that pays more and provides benefits. When I read such opinions, I can’t help but wonder if my former classmates remember back to the days when I, the person at the top of the bell curve, had similar thoughts about them. But, over time, I learned that each of us has fought both visible and invisible battles to get where we are, and success looks different for everyone. No one’s achievement shouldn’t be denied or belittled. But neither should we think everyone has the ability to achieve what we have. Such thinking only accomplishes what the bell curve does: ensures an elite few stay on top while someone will always be struggling to just get by. When I was a little girl, I fell out of bed on a regular basis. Sometimes, I’d pick myself up off the floor and climb back under the covers. Sometimes, my father, who must have heard the thud, would come into my bedroom, scoop me up, and tuck me back into my bed. I don’t remember being particularly concerned or afraid of falling out of bed, nor do I remember my parents worrying about it. It was just something I did until, one day, I didn’t do it anymore. Like so many childhood memories, my habit of falling out of bed was locked away in a part of my brain that only opens with the right key. Sometimes that key is a piece of music, sometimes it’s a smell, and sometimes it’s a conversation. But there are times when I have no idea what key unleashed a memory. It just pops into my mind, and I can’t shake it. Those are the moments when I realize my memories have come out of hiding and dusted themselves off because they are trying to teach me something. And so it was last week with my memories of falling out of bed. As I thought back to those nights decades ago, I realized they represent all of life’s struggles. Those times I fell out of bed were only a fraction of all the tumbles I’ve taken. And yet, I only remember a very small percentage of them – the ones that left behind scars and a good story. But almost every time I stumbled or even completely fell, I had the choice to wallow in the pain and humiliation or to pick myself back up. Those few times when my struggles were so great that I couldn’t just pick myself back up, I was fortunate to have someone nearby who heard the thud and immediately responded with a helping hand. There are so many individuals with no such people nearby. On almost a daily basis, I watch the stream of people coming through my office doors for financial assistance or other social services. I realize that most of them had very few, if any, people nearby listening for their thuds. And I wonder if it’s harder to pick yourself back up when you know that no one else is paying attention to your struggles. I also wonder if knowing that you are safe and that someone has your back makes it easier to teach yourself not to fall. When you trust that people care and realize that falls are part of the learning process, it’s easier to have the fortitude and the ability to prevent self-inflicted bruises. My memories were reminding me that I, like everyone else, needs to pay more attention and react to the thuds when someone nearby, no matter who they are, falls. 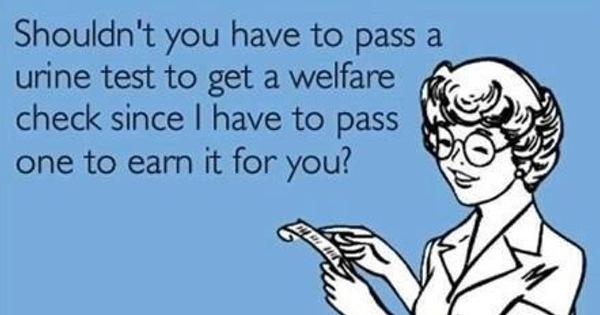 If you don’t know anything about “the welfare system,” then drug testing “people on welfare” makes sense. Even on days when you don’t want to go to work, you show up because that is what is required for you to bring home a regular paycheck. Obviously, “people on welfare” are looking for an easier way to get money. And, because they aren’t working hard like you are, they must spend their time doing whatever they want – including watching television all day and doing drugs. Since they don’t have jobs, the money that “people on welfare” use to buy those drugs is obviously coming from their “welfare check” that we, the hard- working taxpayers, provide them. If they didn’t use the money from their “welfare check” to buy the drugs, then they don’t need a “welfare check” at all. 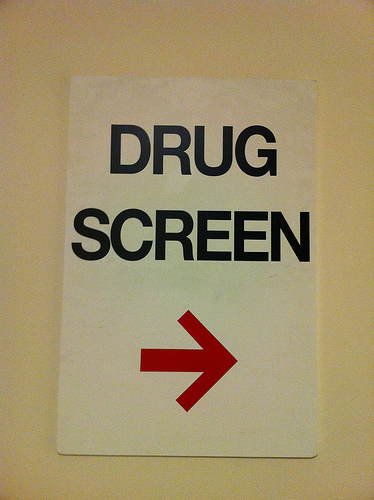 To ensure that no one “on welfare” is using our money to buy drugs, then we have to drug test them. That way we won’t be wasting taxes, right? It’s also a waste money. Requiring drug tests for individuals who receive social services benefits has consistently been shown to increase administrative costs with little else to show for the efforts. When the State of Tennessee started testing individuals who applied for Temporary Assistance to Needy Families (TANF), only 37 out of more than 16,000 applicants failed drug tests during a six month period. Those results weren’t much different from those in other states, such as Utah and Florida. I don’t know what the cost of administering those tests was, but I do know there is no way that those results can be spun to indicate cost-effectiveness. But then, the outcry for drug-testing people who receive TANF has never really been about cost-effectiveness or even helping families with drug addiction. It has always been about pointing fingers at low-income people and blaming them for their circumstances. Despite public perception that “people on welfare” are lazy and don’t do much to contribute to society, the life of people who receive TANF isn’t all that restful. First they have children to raise. TANF, which was established during the Clinton administration, is only available to families with children. It also requires recipients to participate in programs that help them learn skills and gain employment. In West Virginia, TANF recipients are required to sign a personal responsibility contract which they have to follow or they will lose benefits. Even if they do all that is required of them, federal law prohibits them from receiving more than 60 months of assistance during a lifetime. For a small amount of cash assistance (in West Virginia, a family of four receives an average amount of about $385 each month), TANF recipients must go to classes, do volunteer work and actively seek employment. Studies show that the average time any individual receives TANF is 24 months, and that is usually the result of unfortunate circumstances like the loss of a job or divorce. Much like an insurance policy, TANF was available to these individuals who had been taxpayers but fell in tough times until they could once again be taxpayers. I have many more friends who never used TANF not because they never had financial difficulties but because they had the resource friends and family to help them through the crisis. Not everyone is surrounded by people who have the resources to help. But even when we look beyond the stereotypes about who receives TANF, there are even bigger issues.. For example,what happens when someone does test positive for drugs? What will happen to their children (since they must have children to even receive the assistance.) Just as critical, who will be responsible for treatment and recovery services? In my community, those services are usually unavailable and inaccessible to low-income and rural individuals. Advocates have been complaining for years about the lack of treatment programs. Before we focus on drug testing anyone, we must have the community capacity to help those who struggle with addiction. The call for drug testing “people on welfare” only makes sense to those who either don’t understand the social services system or who don’t want to understand it. It only makes sense to people who don’t mind stereotyping low-income people or who don’t realize that’s what they are doing. And it only makes sense to those who think that subjecting people who are already struggling to additional accusations is more effective than subjecting them to a helping hand.